Last Friday night Stu and I went to watch In The Beginning Was The End in London's glitzy West End. 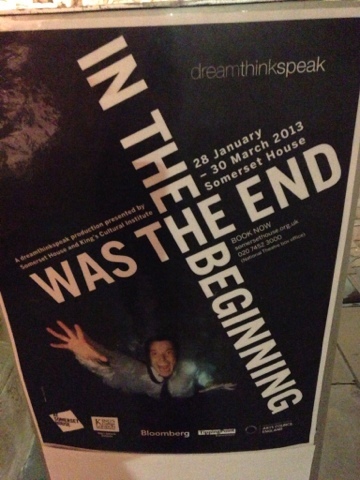 It's a walk-through show underneath, within and above Somerset House and King's College. Allegedly inspired by Leonardo Da Vinci's The Book of Revelation the theme of the show is largely based around Fusion Industries - a fictitious European technology company. You walk between dozens of connecting rooms where people are presenting products in French, Italian and German. You see Fusion's hi-tech products being demonstrated - odd electronics, dancing robots, etc. There are company staff - call-centre drones going mad and getting naked and sales men committing suicide in slow motion. A recurring theme is board-room antics along with fights and hysterics. I've probably made it sound better than it is though. It takes 70 mins to walk through. Stu left early though as he was bored.